Do you plan on taking Kylo Ren as an apprentice this Halloween? Be sure to look the part of Snoke with this Supreme Leader Snoke Latex Mask. The Supreme Leader Snoke Latex Mask is an overhead mask designed to look just like the force-sensitive alien from the Star Wars series. Snoke is affiliated with the First Order. 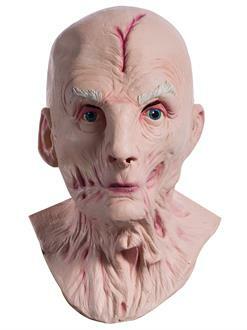 Walk the dark side this Halloween with this Supreme Leader Snoke Latex Mask.